Hannah Yoder loves her quiet life on the banks of the Conestoga Creek. In 1842, this corner of Lancaster County is settled and peaceful--yet problems lurk beneath the placid façade. Hannah's father worries about the spread of liberal ideas from their Mennonite and Brethren neighbors. And Hannah blames herself for a tragedy that struck their home nine years ago. She strives to be the one person who can bind the threads of her family together in spite of her mother's ongoing depression and her sister's rejection of their family. But her world is threatening to unravel. 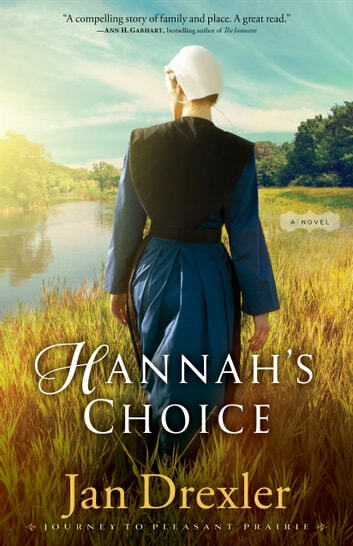 When two young men seek her hand in marriage--one offering the home she craves and the other promising the adventure of following God's call west--Hannah must make a choice. Faithfully perform her duties to her family? Or defy her father and abandon her community? With a tender hand, Jan Drexler teases out the threads of a romance that will captivate readers in this brand-new Amish historical series. This is a wonderful historical Amish novel! The characters are so well developed that by the end of the book I felt like I knew them as well as I do my own family members. This is not just a couple of main characters but quite of few of them. Hannah and her family have faced horrible tragedy in the past. Each of them seems to have handled it differently. Some of them are stuck in the heartache at the beginning of the book. I thoroughly enjoyed seeing how those that had already been able to move on were able to help the others. Hannah wasn’t the only one in the story that had a decision to make. Many of the characters did. The discussions between them were fantastic as they tried to figure out what God wanted them to do with their lives. This was an incredible example of how we should work through tough decisions together. I found this especially true in the context of married couples and family growth and development. I was fascinated by the look into how the Amish people were different from the others in the area prior to the existence of electricity. Jan Drexler also included a wonderful description of the weaving process. This is something I have never known anything about. I am looking forward to the next book in this series. The hard part for me is going to be waiting for the author to get it written. I received a free eBook copy of this novel from the publisher in exchange for my honest opinion. Hannah’s Choice is a novel that is equally composed of history, romance, and down-to-earth humanity. Set in 1842, the novel follows 18-year-old Hannah Yoder as she tries to make sense of the crossroads where she finds herself. Her family might be moving west to join a new settlement of other Amish, her family is still trying to heal from a tragedy that struck years before, her sister is being tempted away from their way of life, and Hannah isn’t sure what is in her own heart for her future. She is presented with offers of marriage from two very different men who would offer her two very different ways of life, and she also finds herself wrestling with aspects of her faith along the way. The narration’s point of view jumps between several of the characters throughout the story, giving a clear picture of what is going on with each of them. Their thoughts, emotions, and actions are well described for the reader to envision the story unfolding. From the protagonist Hannah to her childhood friend, her sister, each of her parents, and her potential suitor, the author weaves a story of decisions, emotion, faith, family, and love. It was clear that the author had done her research, both in the characters and the setting. I found the writing very vivid and captivating; I stayed up late the first night I started reading because I was so caught up in the story and lost track of time! The characters were well-rounded, even the minor characters who only appeared once or twice. Additionally, the struggles that each of the characters faced felt very real; I found myself sympathizing with each of them and feeling their emotions right along with them. The spiritual message is subtle, but it is there, and it is one with which we can all identify: the importance of finding peace in our personal convictions and following God wherever those may lead and whatever the cost. NOTE: I received a complimentary copy of this book from the author and publisher, Revell, for an honest review. I loved this book and i'm loking forward to reading the sequal. Jan holds your attention with her creative writing. Hannah’s Choice by Jan Drexler is set in Conestoga Creek in 1842. Hannah Yoder is eighteen years old. She lives with her parents (Annalise and Christian) and her siblings (Liesbet, Margareta, Peter, William, and Jacob. There were more children but they died nine years earlier from illness (all the children got very ill). Since then Annalise has been extremely depressed (and has treated Hannah horribly). Hannah is good friends (all her life) with Adam Metzler. Adam, though, is a Mennonite. He is in love with Hannah, but Hannah is Amish (her father would never approve the match). Christian Yoder is worried about the lack of Amish in the year. More Amish are leaving the area for greener pastures. Christian is worried about the non-Amish influences on his children (he wants to make sure that the stay Amish). Christian gets an opportunity to move his family to another state where a new Amish community is being started. With this news comes Josef Bender who is instantly attracted to Hannah. Josef starts spending time with Hannah. Hannah will have a choice to make? Stay in Conestoga Creek and marry Adam (with all that is familiar). Or marry Josef Bender and move to a new state (a new life). Adding to Hannah dilemma is an issue with Liesbet. Liesbet (at sixteen) fell in love with an Englischer (who was just seducing Liesbet). Liesbet leaves her home (which makes their father more determined to move) and marries her young man. But life is not rosy for Liesbet (it is not at all what she imagined). What if Liesbet comes looking for them and they are gone? Hannah will have to make a choice. Hannah’s Choice was a good book. It is the first book in Journey to Pleasant Prairie series. I read it straight through late one night. I liked the characters and it was easy to read. The setting sounded so lovely (I do not blame Hannah for not wanting to move). I give Hannah’s Choice 4 out of 5 stars (I liked it). If you like historical, Christian fiction, you will enjoy Hannah’s Choice. It is a well-written story and I am looking forward to the next book in this series. I received a complimentary copy from NetGalley and Revell in exchange for an honest review.